Tahoe Truckee Outdoor: Is canine clothing necessary for Tahoe dogs? Is canine clothing necessary for Tahoe dogs? 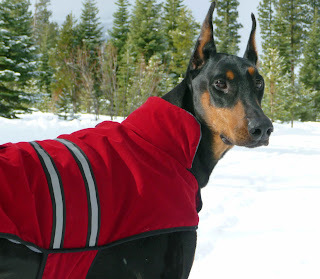 Our dobie wears a jacket on longer hikes. Bitter cold temperatures and romps in the snow may be affecting your dog. 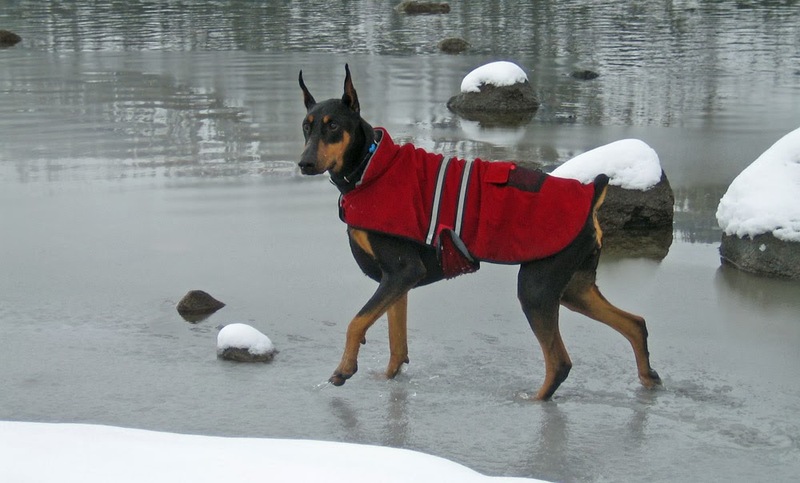 Certain breeds and at-risk dogs can’t maintain their body heat in the cold. Long haired dogs generally do not need a sweater or coat. Dogs like Labs, Huskys, Goldens, and Malamutes have no need for clothing. They can maintain their body heat in the harshest of winters. Dogs with short hair or thin body types can benefit from clothing. Dobermans, Greyhounds, and Whippets fall into this category. If you think your dog has trouble generating enough body heat,get them a jacket for cold morning walks and hikes. A jacket or sweater also helps keep your dog clean and dry in wet or muddy conditions. If your short hair or at-risk dog does get wet, get him/her dry and warm as soon as you get home. Retail outlets like Pet Smart, Amazon, and ebay carry a variety of doggie jackets to keep your pet warm and dry. Mountain Hardware in Truckee has a good selection of dog coats as well. This dog loves to get out in the cold, but she does get cold. your day of Halloween can be hazardous for the pet - especially dark coloured cats. Please follow the advice from the ASPCA and keep your dogs and cats indoors during this time associated with year. Too many cases associated with malicious pet torture and damage are reported, don't let your dog become a statistic.